I really really wanted a glass of wine last night. The cat was nice enough to crawl up in my lap and go to sleep so at that point I told myself I couldn't get up. (Thanks kitty for the assist!) I did have a bowl of strawberries from my local farmer's market before the kitty curled up in my lap, not sure that feeding the sugar demon helps with the wine demon but they did taste good and the wine is a much bigger temptation for me than fruit! I planned ahead though and sipped on a nice cup of left over pumpkin soup while I was getting ready to go so I wasn't the least bit hungry. I had a nice glass of water and mingled and because I never sat down I didn't feel weird about not eating. One person asked and I just told her I had a late breakfast of left over soup and I was still full and that was that. I actually never even walked to the table with the food that seemed to be the best way to avoid temptation but from other people's plates there were raw veggies and fruit so that would have at least been an option. @becs staying compliant with the whole 30 is tough with travel. I know there are people that manage but it would be challenging, hope it works out so you don't need to figure it out. @frogtox I'm a solid middle of the pack runner. I'm not winning any races and only run for me. I've only been running a couple of years and this will be my first anything over a 10k. I'm really excited about my upcoming race! And, because its my first half as long as I finish its a PR! Win! @Angelina_B are you drinking enough water too? I get a little light headed if I start to get dehydrated. Just a thought. I'm thinking about my trip this weekend...I got a bunch of the things suggested on the "travel " section of the website..the smoked salmon in foil pouches should be fine but has anyone had any problems getting through security with little pouches of things like Chia Squeeze (3.5 oz) in a little foil pouch or the little Tetra Pak of Coconut milk (11 oz) a must for coffee on the go! I really don't want to have to check a bag and was hoping to put these in my carry-on..Anyone's advice on this would be greatly appreciated! ( I have a sad feeling these pseudo-liquid foods, ( see pic) might not be TSA-proof ...) )-; ?? @4windsrider - My guess is that the coconut milk will not make it through security. Not sure about the chia squeeze, though, I guess it depends on how "liquidy" it is? @4windsrider I think the fruit pouch would be okay, but the liquid has to be less than 3 oz or something like that. @becs and @frogtox Thanks. I think you're right...might have to put coconut milk into separate small containers....)-: sigh. Happy Friday everyone. We are one third of the way through. Here's to lots of good kitchen prep! I've enjoyed reading all of your posts, and have even copied some of your shared prep ahead tips - thank you! I've been on this forum thread with my start date of 10/3, but haven't posted very much, just because I've been so busy, and before I know it, the day is done. Just checked in today, and wanted to say hello - it's now day 12 for us! We're going to 28 days, this is our second Whole30 compliant stretch with a little gap in between. We have a weekend at the 29th day where we know we won't be able to be in charge of our foods, and that's why it's not a complete Whole30 run. My husband and I are doing very well. It has happened a couple times that one or the other of us will tease with a "chocolate cake sure would be nice right now" comment, but we are both motivated and really not bothered overmuch by the restrictions, so it's ok. I'm going back to meal planning and prep as OH-SO-IMPORTANT. That really is the area where I am closest to packing it in, when I'm looking at a mealtime feeling less than fully prepared to put something satisfying and satiating on our plates. So again, I thank you for sharing what it is you are doing to make this easier. I've been using RealPlans app, and adding my own favorites to it, and that's been helpful in keeping most of the meals from repeating too often. I have begun recently to use my pressure cooker and slow cooker regularly for MAKE-AHEAD protein cooking, and parceling out to meals servings. I'm beginning to feel like a hoarder though, but of prepped food. I feel so satisfied when I see multiple options nicely packaged in the freezer, or waiting in containers in the fridge. As I see my carefully packaged stores diminish, I am pleased that they were there and ready to use, and at the same time, unhappy that they are being used up! I also have three lists going - 1) What's available for this week's meals - which includes fridge & pantry items and items from the freezer that are in the week's plan , 2) Inventory in freezer upstairs, 3) Inventory in freezer downstairs. When I use something up that is a staple ingredient or a prepped-ahead piece of a meal, I add it to the bottom of List #1 as something that needs to be replaced, so I'll know I need to buy/cook and assemble them up again. These lists organize it all for me; I found that without them, it was harder to put the components of the meals together with what was at hand. I'd forget things tucked in the freezer, in the back of the fridge, or turnips/squashes on the cooler basement stairs. All this attention to food and food prep makes me feel like I'm too consumed by it, but I'm trying to find a way that will become a nice, easy way of doing things for life. I also purchased another of Melissa's books today - Food Freedom Forever. Getting myself ready for AFTER the compliant eating days. Welcome to the group, Bonnie! I like the idea of lists for meal planning/staples/etc. I want to start one, just have to figure out the best way to organize it. I am a little late to the party with meal planning! Gotta get it done today. @becs I just got Well Fed 2 and am so excited to try new things! @BonnieStP I'm glad you popped in, and great job to your and your hubs for staying on track. We're more than halfway there, and I have to say this is probably the easiest Whole 30 I've done. I was pretty edgy the first few days, then tired, but now I'm feeling really great. The horrible heartburn that's plagued me for the last month has finally gone! My tummy feels so much better and I can already tell that my clothes are feeling more loose. Trying to figure out how to navigate Halloween weekend/night but think it's a good thing that I'm on such a restricted eating plan. I tend to be all or nothing. Good luck with your second half, everyone! I love my Well Fed 2, and I haven't even cooked from it yet. It's just such a beautifully put-together cookbook! Will definitely be perusing it at length this week to get inspiration for my weekend cook-up. I'm a bit behind most as I'm on Day 14, but man-oh-man are the NSVs piling up! Energy is on the rise, clothes are looser, skin is getting better, mood is awesome, no cravings, and my run this morning was better than ever. The whole popping-out-of-bed-bright-eyed-and-bushy-tailed thing still needs some work, but is seems to be getting easier. Let's have an awesome second half of our Whole30! Well, made my little trip this past weekend. TSA, for whatever reason saw fit to give me pre-screening clearance for both flights (round-trip). 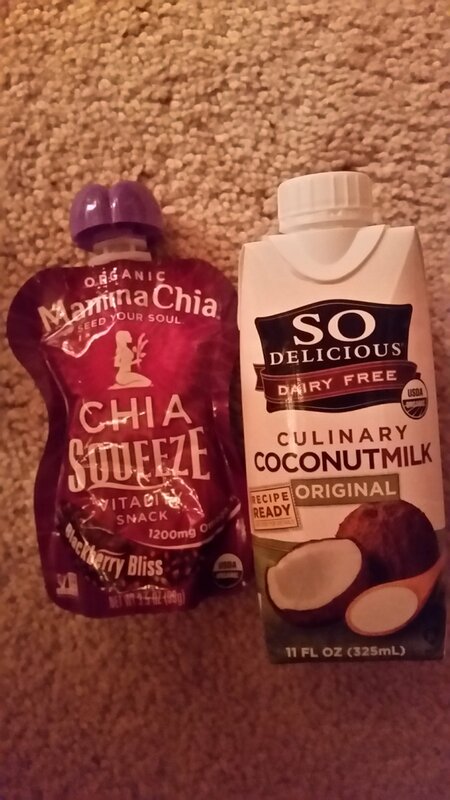 SO, didn't even have to take off my coat or shoes and the Chia Squeeze packets made it through with no problem ! I put my coconut milk into 3 little bottles and used them for morning coffee. Biggest challenge was that my flight was delayed on the way home and I had to kill time for 3 hours in an airport restaurant in Seattle with EVERYONE drinking great beer--except me ! Alaska Airlines is awesome, gave each of the affected passengers $24 worth of meal vouchers for the wait. I had a Cobb salad with w/ oil/vinegar on the side and Perrier with a slice of lime. My coconut chips and raw almonds helped a lot for in-flight snacks. I don't think I've ever flown without wine or cocktails before, so NSV I guess! Three weeks down! How's everyone doing? My energy levels have slumped a bit over the last week - more of an overall lazy feeling than a crawl-under-the-covers feeling, but definitely a move in the wrong direction. I'm pretty sure I know what the problem is, though: not enough food, and especially not enough vegetables. I have not eaten three full meals since Thursday, so I definitely need to work on that this week. This weekend I made the salmon cakes from Well Fed 2 - YUM! Looking forward to popping those babies out of the freezer for future meals. It's funny, though - the recipe calls for Old Bay seasoning, and I couldn't find it at either of the grocery stores I went to. I was a little shocked. Maybe it's just more of a staple on the East Coast where I grew up than it is here in AZ? I ended up buying a random seafood spice mix, and it worked out just fine. I love the salmon cakes recipe too, @becs but find it's too salty, so add less. I usually find the Old Bay seasoning at my grocery store closer to the seafood and not in the spices, where you may expect it to be. I'm feeling pretty good to. I seem to have a lot of energy, but have hit the point where I'm so sick of prepping food I find myself scrounging for things I don't have to put much effort into. Right I have a raging headache that I suspect is from a lack of carbs over the last day or so. I just ate some pineapple and two ibuprofen so hopefully I'll feel better soon. As far as what to do after the 30 days, Ive been thinking a lot about that too. I'm leaving for nearly two weeks the following Sunday to go to a conference, then at the end of the conference my family will join me for a trip to Disney. I'm going to try to focus on eating whole foods and not a lot of junk but it might be hard! @frogtox Hmmm....I woke up with an unusually nasty headache this morning also...lower energy and tired of the "same stuff"...I'm used to headaches with "detox" during any kind of dietary clean-up so not surprised but this may call for an ibuprofen with my veggie scramble. Good luck with your re-etry at Disney (of all places!) LOL ! Hope your headaches go away soon! I think just posing the question here about reintroductions helped me work through my own thoughts. I know reintroduction is a crucial part of the program, and the only time you can do it correctly is after a reset. Looking at my calendar, the time between my San Fran trip and Thanksgiving is the longest stretch I'll have without major holidays/events going on until January 15th. I don't want to wait that long to do another reset! I also want to have the knowledge from my reintroduction to make informed decisions about what food is "worth it" during all the events coming up. That being said, I think I'll just reintroduce after this Whole30, and think about doing another one starting January 16th. Day 51 - Turkey Day! I'm not interested in legumes, or any dairy other than cheese, and this schedule gives me some wiggle room in case I need to take a few extra days in between reintros. I may take a day later on to see if I can handle hummus and soy sauce (the only form of legumes that I might like to add back in). After that, I will most likely stick to the Whole30 in between the holiday parties and trips. We'll see how it goes! @becs great plan! I wish I could do a better job than Day 31: no funnel cakes or novelty ice cream bars, lol I know from previous Whole 30s that dairy re-intro is rough, so will continue to try to eliminate that. My headache went away after a few carbs, which I'm grateful for. I don't generally get headachy after week 2, so I figured that was why. How's everyone doing on Day 25 (23 for me)? Almost to the finish line! Though there isn't really supposed to be a finish line, so maybe I should say, almost done with Phase 1! Happy Day 30 for those of us who started on Oct 3rd! I'm looking forward to whatever may come with my reintro. How is everyone else doing? @MadGab It's still Nov. 2nd here...I'm waiting to go thru Nov. 3rd and will start re-intros on Nov. 4th. I'm really only interested in adding back legumes and from past experience those are A-OK with my body ! Tofu will be BACK. YAY !!! Feeling quite wonderful over the past 48 hours, not wanting this to end. My body is very happy eating this way, and cutting out alcohol. Plan to remain off dairy, sugar, and ideally gluten, going forward. Am finding it relatively easy to prepare meals after 4 weeks of practice. Will reintroduce alcohol, but in serious moderation. Am noticing a positive shift in my energy, state of mind, and overall flexibility and I love it! Thank you, 4windsrider for pulling me along with you on this experiment, it was well worth it! P. S. do you have a "real" wineglass for me? Day 30. Finishing a 3rd W30. I am always reminded at this point that this is simply about eating real food and avoiding all of the ridiculous toxic additives and "ingredients" that modern people have been duped into thinking are acceptable or even necessary ! Sheesh. Grateful for the folks out there who are doing the work and spreading the word to help get some of the population back on track. I will be going forward, as usual, being kinder to my body and being more mindful of what I put into it. @MamaMan, Yes, if you mean a wine glass with one of those stupid "stems" on it, you always have at least one here with your name on it ! LOL ! XOXO ! Day 30 for me, too! So many NSVs, and feeling really confident about reintroductions. The holiday season scares me a bit, but I will have many opportunities to practice mindfulness when deciding what to eat. I know food freedom will be a constant work in progress, but I'm looking forward to it! Had to stop my reintroduction for now. Went to a family bbq and was able to avoid bbq sauce on my ribs and butter in my potatoes but my tummy is not happy right now and my lower back is aching again. Boy, I didn't miss any of this.